Election season is underway and there’s already plenty of gossip and rumors from the crowded-with-illegal-campaign-billboards streets of the Alaska political world. As always, everything in here is varies from complete rumor to poorly sourced information so take everything with a grain or two of salt. Also, before we get started, I just wanted to take a quick moment to remember Anthony Bourdain, who’s had an incredible impact on my own writing, cooking and efforts to meet new experiences and people with an open-minded benefit of the doubt. The audiobook version of his “Kitchen Confidential” has been the soundtrack to more than one of my long Alaska drives, teaching me just how cool and effortless good writing can appear. If you or anyone you know are feeling suicidal thoughts, then please, please, please call the National Suicide Prevention Lifeline: 1-800-273-8255. In Alaska, there’s also the Alaska Careline: 1-877-266-HELP. The entrance of Mark Begich into the Democratic primary sent shockwaves through the political world, turning one side of the gubernatorial race on its head. It doesn’t sound like that’s really the case for the entrance of Mead Treadwell into the Republican primary. Though there was a big behind-the-scenes push to get someone like Treadwell (a more moderate business crowd-friendly candidate) into the race, the thinking across the political world is that he’s currently sitting soldily in second place in the race for the Republican nomination for governor. Dunleavy has plenty of momentum, including a brother-funded PAC with loads of cash. It sounds like Treadwell will still bring plenty of challenge and support to bear on the race, but it doesn’t sound like the Dunleavy campaign is sweating it as much as the Walker campaign is likely sweating the entrance of Begich. If you’re from bougie parts of Alaska that have regular trash pickup, it might come as news to you that most of the Fairbanks area drops its trash off at transfer sites around town–known more colloquially as dumps–that are a combination of trash drop off, scrounging opportunity and social meetups. So when the dirty government comes to mess around with your transfer site it’s big, big news. 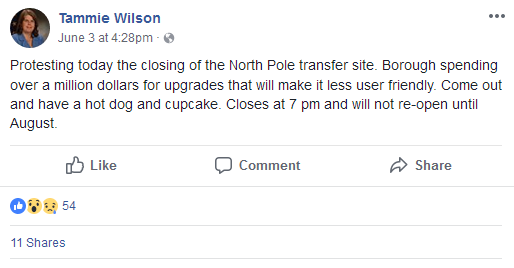 The North Pole one is closing for part of the summer, prompting one legislator into action. The alternative destinations are about 10 minutes in either direction. But, for real, dumps/transfer sites are serious business in the Interior. Hands off! Rep. Charisse Millett has one of the toughest general election challenges ahead of her with a rematch of the 2016 race against Democrat Pat Higgins that she won by just 93 votes, but there’s a rumor going around that there could be a wealthy booster who doesn’t want to see the rematch and could be on the verge of backing her primary opponent in a big way. The word is that there’s somewhere between $50,000 and $75,000 that’s close to being pledged to an independent expenditure effort backing Republican Josh Revak for the spot. Revak’s a combat wounded veteran with an inspiring story about recovery and running a marathon. It sounds like there’s a bit of personality conflicts wrapped up in this, but the main concern is the risk of turning the seat over to Democrats. One of the state’s top political reporters, ADN’s Nat Herz, is leaving the job for a position on the Alaska Public Media’s excellent Energy Desk. It’s a big win for Alaska’s Energy Desk, which is already stacked with talented reporters, but the departure will surely be a hit to the overall landscape of reporting on this year’s elections. Still, Alaska’s politicians have to be breathing a sigh of relief to see the bulldog reporter set his sights on something that’s not them. The House District 9 Republicans have decided to endorse candidates already. In a Facebook post earlier this week, the district officials announced they had endorsed incumbent Sen. Mike Shower for re-election over Mat-Su Borough Assemblyman Randall Kowalke (who was Gov. Bill Walker’s first pick to fill the seat via appointment) and incumbent Rep. George Rauscher for his seat over what’s currently a three-way Republican primary. Also running in the primary are former Rep. Jim Colver and Pam Goode. The local party officials have had it out for Colver since at least 2016 when they endorsed Rauscher over Colver. The bad blood is still there and according to the post, there was never the option for the district to endorse Colver in this round either. There’s a big fear that the sorta-moderate Colver might join a Democrat-led bipartisan coalition, and they’re probably not entirely wrong. The endorsement also pits district against district, as House District 10 Rep. David Eastman’s PAC has endorsed Goode for the seat. Speaking of which, Republican Vicki Wallner of “Stop Valley Thieves” fame has withdrawn from the Republican primary for House District 9 due to health reasons. She had entered after it appeared that former Alaska Constitution Party candidate Pam Goode was going to be the only candidate in the race. When incumbent Rep. Rauscher gave up on the Senate and returned to run for his seat, it was widely expected that Wallner would drop out, but not because of health reasons. We hope she has a speedy and full recovery. Some tone-deaf remarks made at fundraiser for Democratic candidate Liz Snyder, who’s running for Republican Rep. Lance Pruitt’s House District 27, are turning heads. Apparently, Democratic operative Forrest Dunbar–of Politico Magazine’s “How to Turn a Red State Purple” fame–said at one point how hard it is to find quality “women of caliber” like Liz and Ivy Spohnholz to run for office, then stood by her side while she was talking, sharing the spotlight. One insider who brought this to our attention would offer this advice: Sit down and shut up. Update: Multiple people reached out to us on this piece, adding some additional context to the comments. First, we should note that Dunbar was invited to the event and a guest. His comments during the event were definitely welcome and he was there to essentially make the pitch to contribute to Snyder’s campaign after Snyder made her comments. As for the heat turning-remarks, the other people we talked with didn’t take issue with them–or at least anymore than the usual sort of stuff politicians say. Mark Begich made a lot of broad statements in his announcement that he’d be running for governor last week, but one in particular caught the attention of News-Miner editor Rod Boyce (who was also adept at catching my messy copy during the six years I worked with him). Begich claimed the FBI labeled Alaska the “most dangerous state,” but thanks to Boyce’s fact-checking it turns out the FBI doesn’t make any such rankings. There’s a third-party group that compiles the uniform crime report statistics from the FBI that came up with the ranking, but it’s not directly from the FBI. The report points out that both the independent expenditure group backing Mike Dunleavy and candidate Scott Hawkins have also made similar claims. The only one to get the source correct, however, was Hawkins. Disgraced former Rep. Zach Fansler is due to be arraigned in Juneau court later this month to face a charge of second-degree harassment, a misdemeanor, for slapping a woman across the face hard enough to send her to urgent care for a ruptured eardrum. According to the Juneau Empire, the state expects Fansler to plead guilty to the charge, bringing this incredibly drawn-out case to an end. Perhaps he’ll also have the decency to also stop by the Division of Elections and withdraw from the race for House District 38. Anchorage Assemblyman Tim Steele announced this week that he would be resigning due a “serious health condition.” Steele was elected to represent District 3, which covers West Anchorage, in 2017 and his term was set to expire in 2020. That will prompt a special election within 60 days of Steele’s resignation date, which is set to be June 12. Already, we’ve heard that Austin Quinn-Davidson, who works with the Great Land Trust organization, will be running for the seat. Quinn-Davidson said she’s been considering running for the assembly since 2017. I’ve spent the last few days digging through voter information, making the legislative races rundowns far more complicated than they ever needed to be. I’ll be putting more of this together for a bigger post next week (there’s still some things I want to look into before making any declarations), but here’s one interesting takeaway from the initial survey. Republicans and Democrats have lost ground in EVERY SINGLE House district in Alaska since 2016. What that means is that the leading two parties make up a smaller percentage of total voters in every single district in Alaska (even though some saw their registration numbers increase) since the 2016 election. That’s largely because the number of undeclared voters in each district have grown by pretty considerable margins, gaining anywhere between 2 to nearly 5 percent since then. There’s plenty of reasons to guess why this might have happened. We’d hypothesize that big-ticket presidential years drive people to register with a party, while in non-presidential years when people are updating or newly registering they’ll be more likely to lean toward the non-partisan or undeclared registration. That’s one of the things I plan to look at with some more of that number-crunching I mentioned above. I’m sure there’s a dozen other hot takes to be had on this issue, what’s your thought? Perhaps there’s dissatisfaction with both political parties. Last week, Lt. Gov. Byron Mallott made official what many had been expecting regarding the fate of the good governance initiative when he ruled that House Bill 44 is, in fact, pretty much the same piece of legislation. That initiative, which was backed by Reps. Jason Grenn and Jonathan Kreiss-Tomkins with the assistance of Midnight Sun Publisher Jim Lottsfeldt, would have put legislative per diem and conflict of interest rules on this year’s general election ballot. But that’s not meant to be, and it sounds like Gov. Bill Walker is expected to sign the bill into law, which would be the final nail in the intiative’s coffin. Let us know about campaign stuff! Now that campaign season is underway, feel free to hit us up with reports and boasting about your political campaign’s progress and heavily attended fundraisers. It’s a mainstay of political gossip columning in an election year, especially when the real benchmarks of APOC reports are more than a month away. As always, you can find me at matt@midnightsunak.com. The campaign kickoff for House District 4 Democratic candidate Grier Hopkins this week drew more than 150 attendees. You should expect no less for a candidate who’s been a key Democratic campaigner for the Fairbanks area, as well as the nephew of the retiring Rep. David Guttenberg and son of former Fairbanks North Star Borough Mayor Luke Hopkins. Thanks to everyone who’s slogged through the overly detailed rundown on all the House races we’ve been doing this week. After getting done with the first four, there’s about a dozen different changes I would have made to how we put them together. There’s a bit of additional information that has been shaken loose on some races that we’ll add here. House District 36: It doesn’t sound like the challenges to incumbent Rep. Dan Ortiz are nearly as serious as we initially thought. That race has gone from lean independent to safe independent. House District 9: Another observer suggests that Rep. Jim Colver probably actually has the edge in the Republican primary despite the district’s refusal to endorse him. That’s because Rauscher can look forward to splitting the conservative side of the vote with Pam Goode. The withdrawal of Vicki Wallner improves his chances, but Rauscher only had a 122-vote margin over Colver in 2016. House District 34: Even though we gave the edge to Republicans in the Juneau valley seat, one reader pointed out the district did vote for Obama in 2008 and 2012 and Clinton in 2016. Given that, it’s probably closer to tossup than we thought and its long-time hold by Republicans was probably more credit to former Rep. Cathy Muñoz than anything else. 1 Comment on "Friday in the Sun (June 8): The Start of Election Season edition"
Perhaps the change in voter registrations is due to the automatic registration of PFD recipients?